On Wednesday, a daylong conference held by New Ventures Maine brought over 100 County students to Northern Maine Community College, hoping to expose girls to nontraditional career options. PRESQUE ISLE, Maine — On Wednesday, a daylong conference held by New Ventures Maine brought over 100 County students to Northern Maine Community College, hoping to expose girls to nontraditional career options. This year marks the 16th annual Totally Trades conference, in which students in grades 8 through 12 experience workshops that teach them about trade and technical careers such as plumbing and heating, forestry, construction, heavy equipment operation, computer programming, wind power and welding. All those careers are defined as nontraditional occupations, meaning that people in one gender comprise less than 25 percent of individuals working within each field. Gail Thibault of Northeast Paving helps Caitlyn Arce, an 8th grader from Washburn District Elementary School, take measurements to build a toolbox during the Totally Trades conference at Northern Maine Community College in Presque Isle on April 10. Suzanne Senechal-Jandreau, regional manager for the central Aroostook office of New Ventures Maine, said that female students do not often consider trade and technical career paths due to the higher number of men in those professions and to traditional stereotypes of “jobs for women” not involving heavy equipment and machinery or hands-on, tool based projects. During the conference, 110 students from schools in Presque Isle, Caribou, Washburn, Fort Fairfield, Ashland, Easton, Limestone, Houlton, Van Buren and St. Agatha participated in Totally Trades. Senechal-Jandreau noted that originally, 163 students were registered, but many schools had to forgo the trip to Presque Isle due to the snowy and hazardous road conditions. 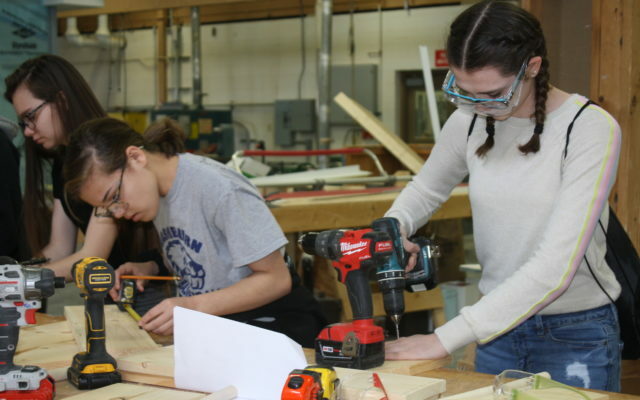 Some of the goals of Totally Trades involve teaching students about the financial and personal benefits of choosing a trade or technical career as well as instilling greater excitement in girls who have genuine interest in those pathways. 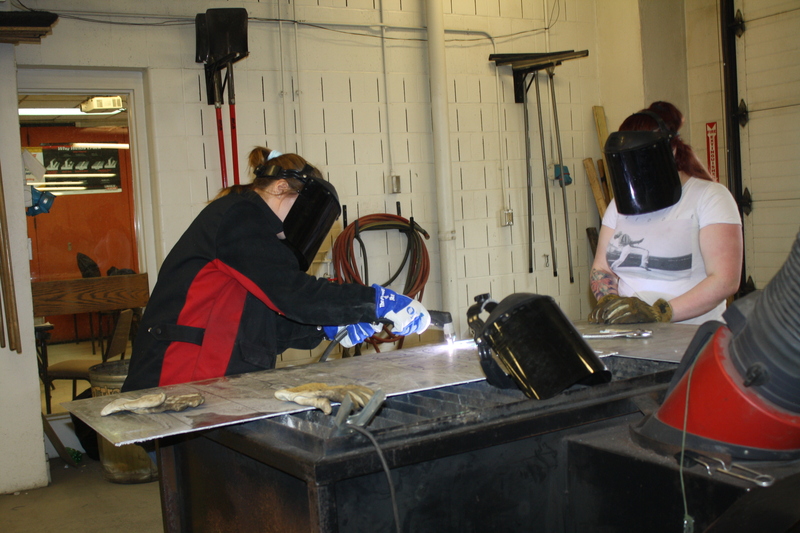 Students enrolled in an afternoon welding workshop, for instance, learned that the national average starting wage for female welders is $19.35 per hour and $40,240 yearly. Those who pursue careers as equipment operators could begin by earning $22.61 per hour and $47,040 per year, while computer programmers could earn $39.54 per hour and $82,240 per year. Many girls who attended Totally Trades on Wednesday already have a passion for the trades, including Tia Cyr, a senior from Caribou High School. Cyr said she is interested in possibly pursuing a career in either heavy equipment or truck driving. Rachel Drost, a senior at Presque Isle High School, noted that she has already been accepted into NMCC’s liberal studies program for the fall 2019 semester. She has attended Totally Trades since her 8th grade year, but is taking time to consider what career she would like to fully pursue. Emily Green, (left), a 10th grader from Fort Fairfield High School, tries out plasma arc welding techniques during the Totally Trades conference while NMCC welding student Hannah May looks on. Throughout the day, students were able to interact with women who are pursuing or have succeeded in their chosen career paths. 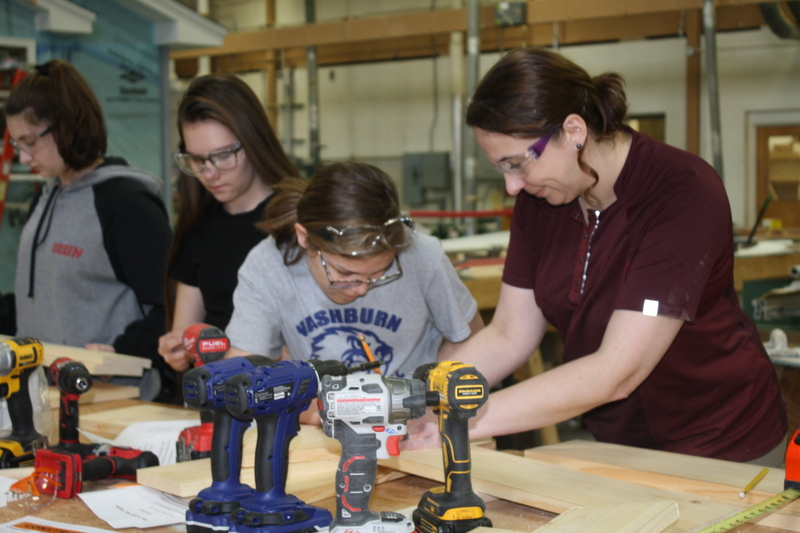 First-year NMCC welding student Hannah May led many through a quick lesson in plasma arc welding while Gail Thibault of Northeast Paving helped students build toolboxes during a construction workshop. “I would tell anybody to just give it a try,” said May, who attended Totally Trades as a high school student from Houlton three years ago. Thibault is a 2010 graduate of NMCC’s building construction technology program and has led the “Build Your Own Toolbox” workshop for Totally Trades since 2013. She embraces the opportunity to show other girls what they can accomplish in the field. “I think the best part is the excitement on their faces after they’ve completed their tool box and realized that they were able to make one themselves,” Thibault said.